In the first part of this series a couple of weeks ago, I dealt with the frequent questions about why God was supposedly such an angry, vengeful God in the Old Testament but now is a merciful and gracious God who declares all of His people righteous and holy through the blood of the Lamb, Yeshua HaMashiach. Please go back and read that episode (What would you do if you were God) to get the full context if you have not done so. In today’s blog, I wanted to delve into the motives and intents of God’s heart in creating human beings, the crowning work of His creation. When God [Elohim] first created mankind, He said, “Let us make human beings in Our image, to be like Us” (Gen 1:26 – NLT). The first thing I noticed when I read this passage is that God spoke of Himself as a plural being. As we have taught before, God [Elohim] is a name for a triune God representing all three persons of the Godhead (Father, Son and Holy Spirit). So when God says He created us to be like Him, He meant all three persons of Himself. You could loosely relate the whole essence of our being to these three persons – we certainly have a spirit (relating to God’s Holy Spirit and even able to be filled with the Holy Spirit), and we have a fleshly body, which relates to Yeshua when He came to Earth in the flesh. But what about our soul – our mind, heart, will and emotions? The Scriptures speak clearly about the mind of God (Num 23:13, Rom 8:27, Job 12:13, Isa 40:28, I Cor 2:16). We know from stories like the prodigal son about the loving heart of God the Father (Luke 15:11-32). We also know that God created us to have emotions like Himself: love, compassion, joy, anger, etc. (see Job 20:23, Ps 74:1; 86:15, Jer 7:20, Isa 62:5, Zeph 3:17). Finally, God’s will is supreme in the universe, and He wants us to follow His will to the best of our abilities, with the help of the Holy Spirit – in Romans 12:2, Sha’ul says: “…you will learn to know God’s will for you, which is good and pleasing and perfect”. God not only created us with a will as part of our souls; He created us with a free will to make our own life choices. Because God is all-knowing, He knew that many of His children would make bad decisions in their lives and damage or destroy their lives. We see people every day making bad choices that cause them physical and emotional pain either for themselves or others, falling into addictions, committing crimes against others or treating others unfairly. So why did God give us free will, and “what would you have done if you were the Creator God”? The Scriptures say that “God is love” and that He is the source of all love. He created us in His image, to love Him and our fellow brothers and sisters. 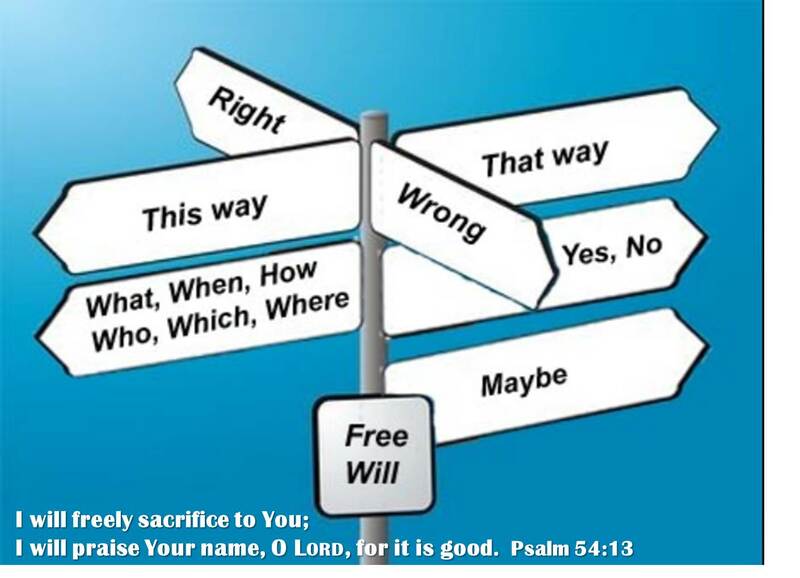 Many people choose not to love God or follow His will, but rather they follow their own selfish will. Because of their bad choices, they cause great pain and suffering to themselves and others. So what if God had “programmed” our minds and hearts to love Him, so that we had no choice but to love Him. Everyone would love Him unconditionally, but would God be pleased and rejoice over us? If I were Him, I would be sad and depressed, knowing that my creation loved me, but they had no choice in the matter, so it wasn’t fulfilling and their love didn’t mean anything to me. God is a God of relationships, and He created us to be in relationship with Him. When we love and trust Him as our best friend, Lord and ruler of our lives, we have the greatest joy and fulfillment possible, and God smiles and rejoices over us because we have chosen the best path and because another one of His children loves Him of their own free will and has a personal relationship with Him.